Now that barbecue season is upon us, I feel the need to grill everything. Although most of the ingredients in this salad are raw, the grilled corn gives a perfect kick of flavour and colour. 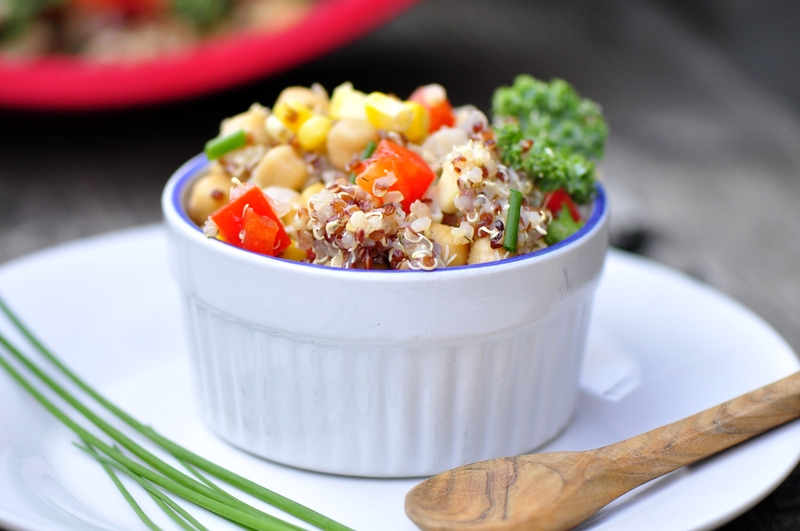 Pair that along with quinoa and a light dressing and you’ve got yourself a protein-packed vegetarian side dish for picnics, lunches and parties. This is a recipe is built for summer because it’s really quick, lasts for days in the fridge and brings a colourful aspect to your plate. Since it’s not drowning is a heavy dressing, it’s very portable and won’t make you feel sluggish afterwards. Sidenote: The other night, I re-made my Avocado Pesto and threw in some of the fresh herbs listed above—it made it that much better. I find store-bought pesto to be loaded up with salt and oil (which can admittedly be awesome) but when you feel like something light, healthy and still satisfying, this is definitely the way to go. In a medium-sized pot, add quinoa, two cups of water, dill, vegetable stock and hot sauce. Bring to a boil then reduce heat and simmer, covered, for 15 minutes or until all moisture has been absorbed. Set aside. 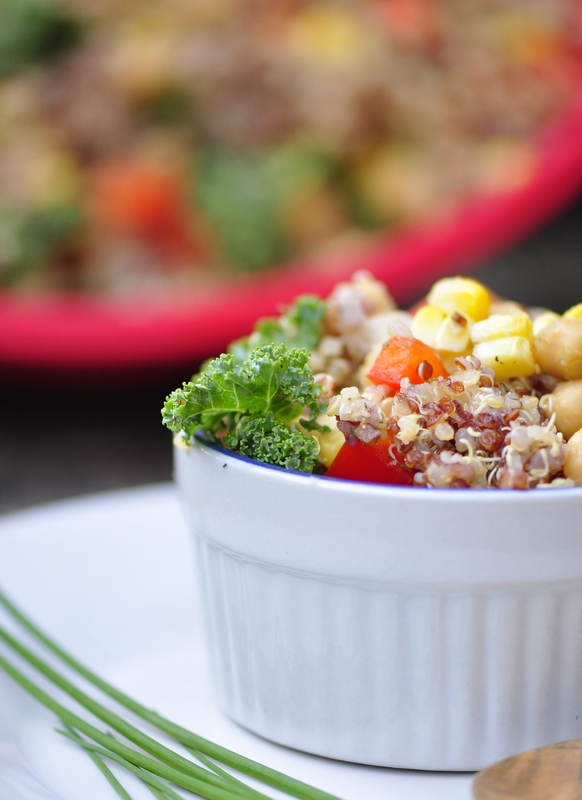 In a large bowl, mix chickpeas, bell pepper, kale, and grilled corn kernels (you can cut them off with a knife), celery, chives, black pepper and lemon juice. 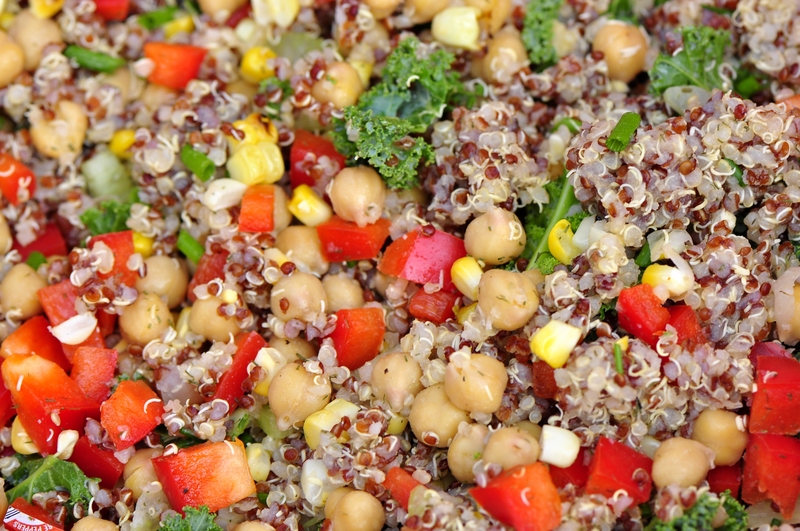 Toss quinoa into the bowl until all ingredients have mixed well together and serve hot or cold as a great summer sidedish. This looks absolutely amazing! What a great combination of fresh, delicious flavors!